Another in a string of lackluster ideas, destined for the bottom of the heap. I just realized I only made it a fave, I want to make it my life! I like yours better than the " grapes of wrath " I did.. Very creative..! OMG Ken... This is the BEST !!!!!! I am slipping, going to have to call you for wicked whacked ideas!!! Think how much better it would have been if it had a link to Kens page - or his watermark on it instead of someone else's . .
Hey man. Did you see that George Takei has your shot on his FB page? Oh my! Only you, Ken, would have a supply of googly eyes on hand - and in the correct sizes. made me laugh. I like. Dang. there he goes again. Playing with fire and making it look easy. It's cos we luuuuuuuuuuuuuuuuuuuv ya, we keep coming back to see it!!! Message edited by author 2009-10-27 23:55:42. Such a wonderfully silly picture - hit's the spot for me everytime I see it. I love this it�s just gotta make you smile. You clearly love what you are doing. It comes across in so many of your pictures. 38917 Views, as it stands and you're on the front page of Most Viewed Images.....and at the top of that page, I should add. Nice landmark. 4 matches, 4 grapes, 4 posicle sticks, 3 rubber ducks and a Sharpie...who'da thunk? The creativity and the patience of some people never cease to amaze me. This is so cute, and in a weird way, fits the challenge very well! I think you should send some creativity my way. I seriously lack it! Looks like the "ducks of discontent" are approaching. Great shot! Bet you had to hustle after the torches were lighted. hahaahhahaaa... i must have taken this week off (viewing-wise). this is hilarious! Message edited by author 2006-06-09 19:47:05. This is such a riot! You are a nutty genius! LOL How many of these little guys did you burn before you got the shot? ;) Great focus/DOF, color, & timing to pull this off! Hilarious ,,,, howsabout The Attack of the Killer Tomatoes ! Absofarginglutely delightful. They reminded me of South Park characters, especially the expressive mouths. Someday I wanna borrow your grape glue. Congrats! Hey Ken: This is funny and Congratulations on your top 20 finish. Didn't think it would be proper to put a thumbnail inside your photo comments. Tribute to Ducky, I guess this was also a Deja Vu entry. Just needed a puddle of water and a blue background. I had a feeling it was you Ken, kudo's on a top 20 finish, you beat me again. hahaha! This had to be you! Congrats on a top-20 with this lampoon! Anyway, was checking your profile for latest submissions and saw this one. I must say, it's hilarious! Sorry didn't vote for the Literary Challenge. The grapes reminded me of Mr potato head, lol - I wonder if you've watched their cartoons before. Congrats on the 19th placement! Hilarious photo! Good job on the top 20 placing!! That's so funny. Congratulations on top 20! Hehe, got a good chuckle with this. Grats on top 20! Not really depicting any passage from the original. 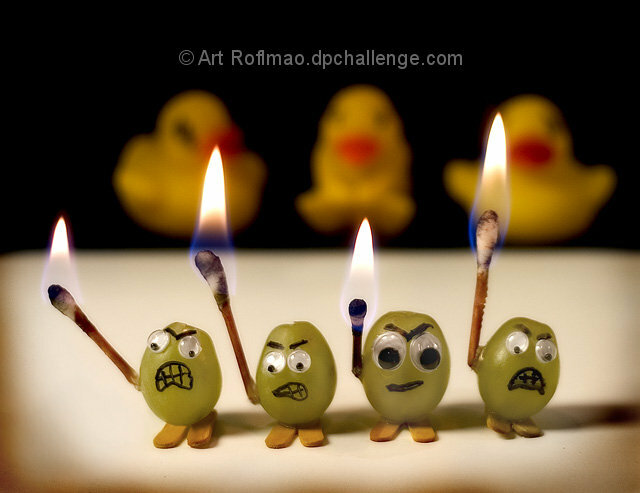 However, points for effort - you must have taken a long time to adorn your angry grapes. 9 for making me laugh. those are the most expressive grapes I've ever seen. Even the way they're holding their "torches" is highly expressive. Gotta love a picture with duckies, flaming cotton swabs, and little eyes on grapes. has this one done b4! Made me laugh out loud. Very creative indeed. Ha, ha. 10 because ..., i dont know, bravery! and a well exposed shot. very goofy..i love it. 10! Nice setup... amusing, interesting. love the torches. Very funny. I am not too sure about the out of focus rubber ducks in the background? Now, this made me chuckle! Lose the ducks and it is really great. They are unnecessary in my opinion. not sure what the ducks are doing in the background but i like it! Now this is amusing! Still laughing. Very creative! Really cracked me up. I love it! Hahahahahahah! Now, what I want to know is how many grapes, ear-buds, and burnt plastic eyeballs did you have to go through to get it right. I like how each grape has their own expression and character. I like how they all cast their shadows. Not a clue what the ducks are about (can't remember the book). Wish I could vote in this one. Anything that gives me a genuine bellylaugh gets a 10.
lol - I love humor! HA! HA HA! Oh, man, thanks for the laugh. Brilliant. LOL! I love it! Great creativity for this title. Good luck! Proudly hosted by Sargasso Networks. Current Server Time: 04/24/2019 08:36:45 AM EDT.